Among other things today so far, I went to Meijer's's, where I got two plastic-rubber-type bins, one for dog stuff (I don't know whether I'll be using it with another dog, donating it, or leaving it for someone else to deal with when I'm dead) and one for Lula stuff. I think the Lu stuff'll go in the pink one, and the dog stuff in the dark brown one with the woven effect/texture. It's gonna be a while before they're filled and ready to be stored. The crate will proably not be collapsed and stashed somewhere until past then. I'm in no hurry. But I'm getting after some of it nonetheless. Maybe I'll keep things cleaner now that one of the more major of the mud-trackers and hair-shedders is no longer helping me mess up the place. 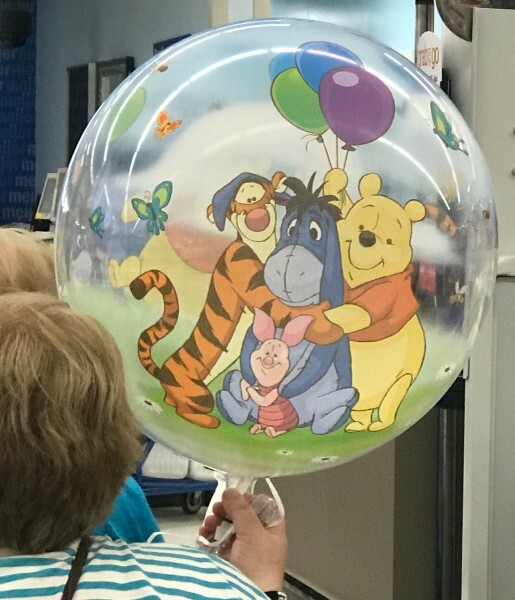 Isn't that a great balloon? I love that balloon. That's why I took a picture of it and showed it to you. Lookit 'em, lovin' on Eeyore. Gonna go meet peteralway for some cheap nosh in a few. I'm poor again, with the debt from the vet bills, and the fact that people gave me money to help with that burden is helpful in focusing myself on thriftiness. But I'm still gonna do the occasional small extravagance, like IHOP. And I also had an idea, there in the Meijer's's, of a memorial tribute to the dog. I'd walked in through the garden center and kinda thought maybe some yard sculpture thing might be a nice remembrance/monument, but then "nah"ed that idea pretty quick. The whole idea of a memorial, in fact. But right after that I saw some windchimes. This year when the weather got nice Lula and I got in the habit of making our neighborhood walk head for a particular set of windchimes at a particular house a coupla blocks from here. I just loved the sound of those windchimes. I recorded them one day, standing out there with her. I bet I can get that onto youtube somehow so's to share the sound with you. There were birds too that day. I wanna get some nice deep pleasing-tone windchimes to string up in a tree and honor Lu. But I'm in no hurry on that, either. I'll wait 'til I find the right windchimes.